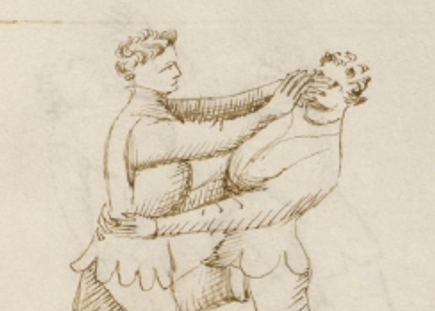 The common wrestling in the Medieval and Renaissance era was different to the combative wrestling shown by Fiore de Liberi, and his art appears to be a counter to the more common style. In his introduction to wrestling, Fiore is quite clear as to the two types of wrestling. 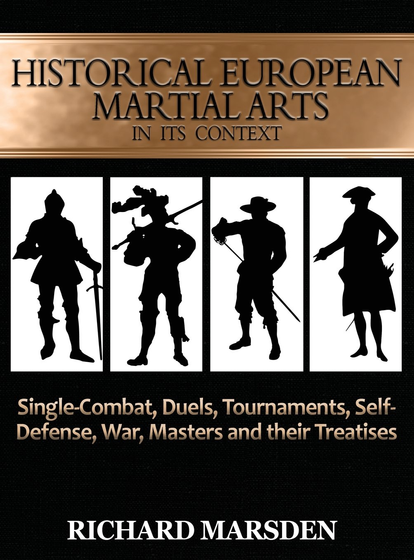 Fiore proceeds to depict four guards, one fight master, and from him, twelve scholars performing techniques, as well as three counter-masters. By reading the entirety of Fiore’s work, more techniques can be found, such as certain locks which he calls keys. Fiore’s system of combat was not meant to fight its mirror and in the case of the wrestling, it appears that Fiore’s system is countering the play wrestling he referred to in his introduction. This is not so far-fetched. People revert to what they know. Fiore was well-aware of the play wrestling, and that play wrestling was common throughout Europe. In a combat-setting, Fiore appears to assume that most opponents would use what they know, play wrestling, rather than mortal wrestling. This can be best divined by looking at the opponents in Fiore’s wrestling, rather than at the master, scholars and counter-masters. 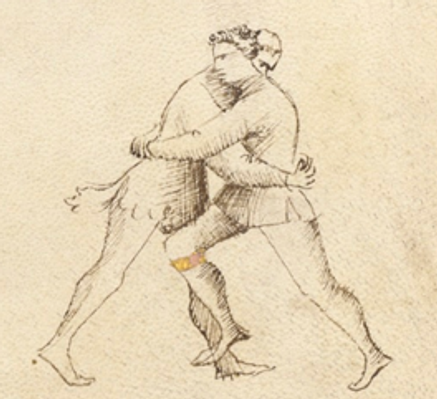 The opponents are attempting a high, middle, or low grapple, and these grapples can be seen in art depicting wrestling in the Medieval and Renaissance Era. 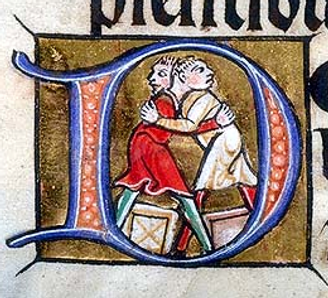 Play wrestling was initially popular with both high and low born. The nobility of France and England engaged in a day of wrestling instead of jousting at the Field of Cloth of Gold in 1520. 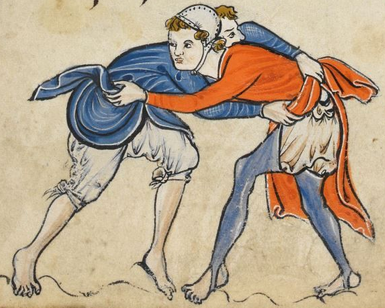 In London, inner-city inhabitants and suburbanites rioted in 1222 over a wrestling match. And in a 14th century work entitled, How the Good Wife Taught her Daughter, the mother tells her child to, "Ne go thou out to no wrastlying." While popular in the Medieval and Renaissance era, by the 17th century wrestling became more a rural and folk sport that was nearly lost, and today is preserved by a variety of European folk wrestling associations. Looking at the sport wrestling of Europe, there are many variations, but common customs can be found through a variety of sources, including the opponents in FIore's work, the Flower of Battle, but also in historical descriptions, artwork, and today's preservation efforts of European folk wrestling. A high grapple is an attempt to grab the opponent by the upper shoulders, arms, or behind the neck. In this play, the opponent has secured a high grapple around the neck of the scholar. The scholar prevents this by reaching around the opponent’s arms and attacking their face. If that does not work, Fiore directs the scholar to grip the opponent’s leg and push their jaw so as to throw them. The high grapple can be seen in a variety of depictions of sport wrestling and in religious art, which may very well be influenced by sportive, rather than mortal, wrestling. In Brittany, France, a folk-style of wrestling called Gouren was practiced in rural areas for centuries. 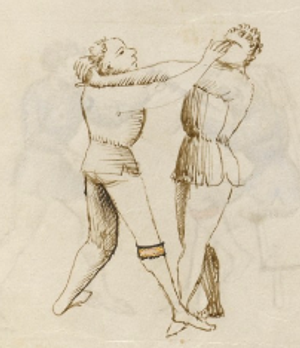 This is a sportive wrestling whose roots lie in the Middle Ages and whose rules and customs were developed over time, but recognized as early as the 17th century when Richard Carew in 1602 specified there was differences between the wrestling of Brittany and that of Cornwall, though he implied they were closely related. In 1930, Charles Cottonec established rules for Gouren, based off traditional customs, to prevent the art from vanishing. The rules require the wearing of a shirt, and this shirt can be gripped so as to throw the opponent to the ground. While a middle grapple is more common, a high grapple is allowed. Clawing the opponent’s eyes out- is not. Example of Gouren (Breton) wrestling and a high grapple. 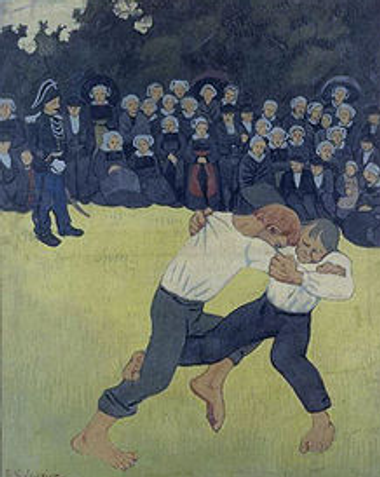 Breton wrestling from the modern era depicting a high grapple. The Seven Planets: Sun, attributed to Georg Pencz, 1530-1550. Fencers practicing can be seen on the right, while on the left two wrestlers seek a high grapple with one another’s shoulders. 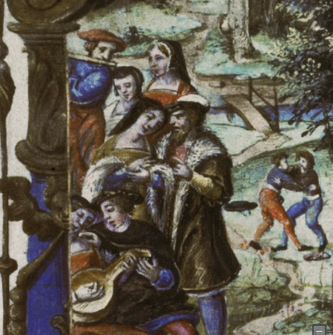 Romans at their games, Facta et dicta memorabilia (BNF Fr. 288, fol. 225v), c. 1470-1480. Depicting play wresting as well as forms of exercise. A high grapple to the arms is being sought by both opponents. From here, an opponent could try to secure the neck, or transition to a middle or low grapple. Entertainment at the court of King Altistrates, Apollonius von Tyrland (ÖNB cod. 2886, fol. 4r), 1467. Both wrestlers are attempting high grapples aimed at the shoulder. While throws and trips were allowed in such practice, the gouging of the eyes was not. 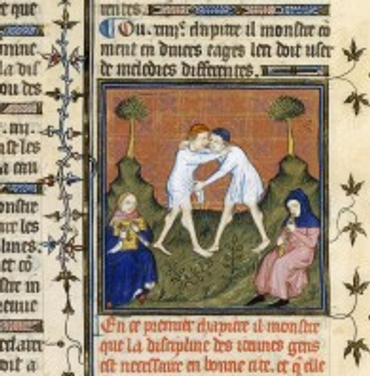 On education, Aristotle’s Politics (BNF Fr. 204, fol. 286v), c. 1380-1390. The wrestler on the left has completed a high grapple to the opponent’s neck. The opponent on the right has grabbed on to his opponent's clothing, a common practice in sport wrestling. 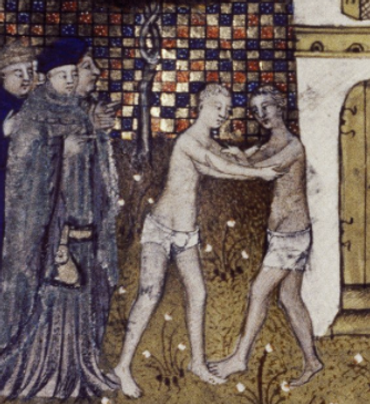 Outside a bathhouse, two youth wrestle. High grapples are sought about the arms, but could transition to a middle or low grapple. The middle grapple is the most commonly seen grapple in Fiore’s work and commonly found in Medieval and Renaissance art. It can also be found in modern continuations of folk wrestling throughout Europe. A middle grapple attempts to bring one arm high, around the shoulder, and another around the waist and lock the hands together. From here, the upper body and leg are used to throw the opponent. Fiore’s response to this middle grapple is to check the arm going low with the left hand, while allowing the one going high to grip the shoulder. From this position, the arm that went high is rotated with the right hand, while the arm below is abandoned. From here, by gripping the right wrist with the left hand, and crossing the legs, it is possible to violently uncross so as to break the arm and/or throw the opponent. If the opponent resists this breaking of their arm, by retracting it, Fiore demonstrates a throw that can be done and a variety of other techniques. The grapple the opponent wants, Fiore shows, but warns against it because it has to be done quickly. It’s easy to see why. Either opponent can throw the other and neither has any advantage. However, this type of grapple is seen commonly in folk wrestling and historical art. It is from here that much of the play wrestling took place, where throws and trips won the day and the starting off at a neutral position was seen as fair play. Henry VIII and Francis I met at the Field of Cloth and Gold to try and foment better relations between England and France. 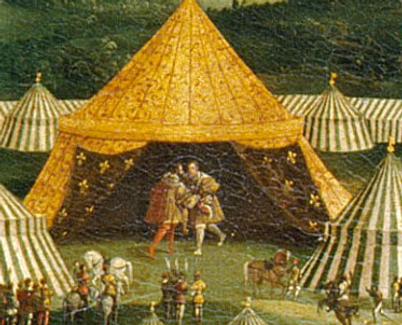 At the event, Henry VIII suddenly embraced Francis I and sought to play-wrestle. Though smaller in frame, the French king was able to throw Henry using a trip. 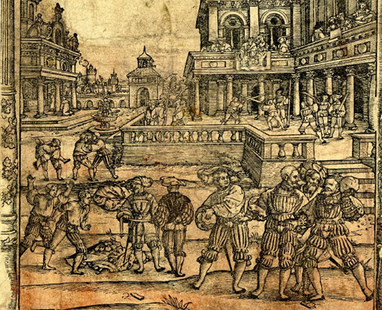 In this 16th century depiction, the two kings are in the process of forming a middle grapple. In the Old Testament, Jacob wrestled with an angel for a night, until the angel pulled Jacob’s hip out of joint at the break of day. Religious art depicting Jacob and the angel is quite common, and this example is likely based on play wrestling (hip tearing in the story aside). Here, Jacob and the angel have a middle grapple. From an illuminated manuscript, the wrestlers have grasped one another in a middle grapple, each seizing the belt, or girdle of the other. This type of play grappling is still found today in folk wrestling and was described in the 17th century by Richard Carew’s Survey of Cornwall. The Cornish style of wrestling was described as a safe form of entertainment. to their practice: for you shall hardly find an assembly of boys, in Devon or Cornwall, where the most untoward among them, will not as readily give you a muster of this exercise, as you are prone to require it. 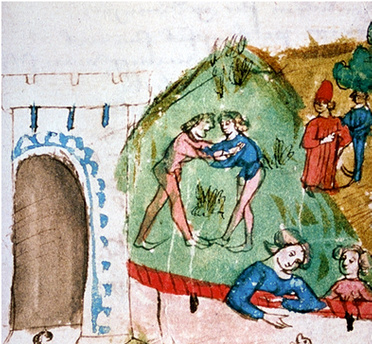 For performing this play, the beholders cast themselves in a ring, which they call, Making a Place: into the middle space whereof, the two champion wrestlers step forth, stripped into their doublets and hosen, and untrussed, that they may so the better command the use of their limbs, and first shaking hands in token of friendship, they fall presently to the effects of anger: for each, strives how to take hold of other, with his best advantage, and to bear his adversary down: wherein, whosoever overthrows his mate in such sort, as that either his back, or the one shoulder, and contrary heel touches the ground, is accounted to give the fall. If he be endangered, and make a narrow escape, it is called a foil. This (wrestling) also has laws of taking hold of only about the girdle, wearing a girdle to take hold by, playing three pulls, for trial of the mastery, the fall-giver to be exempted from playing again with the taker, and bound to answer his successor. Many sleights and tricks appertain hereunto, in which, a skillful weak man will soon get the upper hand of one that is strong and ignorant. Such are the Trip, Fore-hip, Inturn, the Fall, forward and backward, the Mare, and Divers other like. In the modern era, Cornish wrestling was preserved in 1923 by the creation of a wrestling association, much the same way Gouren was preserved in 1930 in Brittany. Today, the wearing of the girdle is not necessary, but the middle grip is still used to try and throw the opponent. Cornish Wrestling from 1926, depicting both high and middle grapples. In Sardinia, Strumpa, is the form of folk wrestling and looks similar to folk wrestling found throughout Europe. Strumpa from 2013 depicting the middle grapple and throws. Scottish backhold wrestling is similar, with each grabbing the other about the waist. Two wrestlers at play, they have each performed a middle grapple, and similar to Cornish wrestling, have grabbed onto an article of clothing. From here, the use of twists, pulls, trips and falls can be used to bring an opponent to the ground. 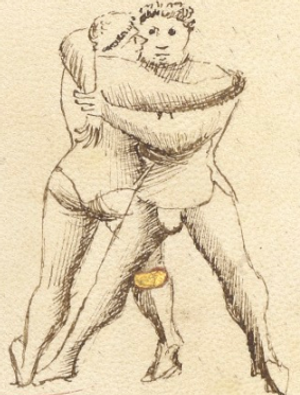 Female wrestlers, supposedly seen by Marco Polo, depicted in a middle grapple. The low grapple is when the wrestler seeks to wrap his arms around the waist of the opponent and throw them. As with the high and middle grapple, Fiore shows a rather violent way to thwart such play wrestling. Such as a knee to the groin. Or strike to the face. As with the high and middle grapple, the low grapple can be found in folk wrestling today and in art from the past. In Scandinavia, the use of the girdle can still be found in folk wrestling that may have roots as far back as the Viking era. In the modern era, the art of folk wrestling is known as Glima and comes in varieties, such as Lausatok, a free-form wrestling, Hryggspenna, a type of backhold wrestling, and Brokartok, a form of belt wrestling similar to the girdle-wrestling described by Richard Carew. Early 20th century Glima of the Brokartok variety. Each opponent has a lower grapple and tries to use the girdle to throw the other. 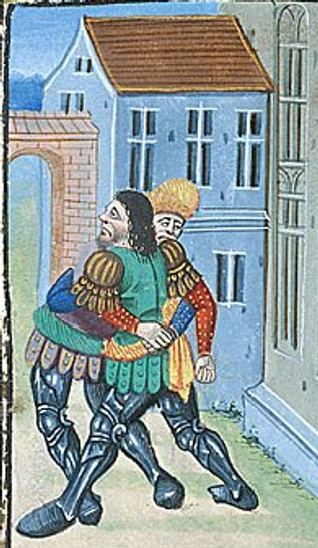 The wrestling of Hercules and Achelous, in a French translation of Ovid's Metamorphoses (Netherlands, 4th quarter of the 15th century): London, British Library, MS Royal 17 E. IV, f. 136r. The wrestler on the left has secured a low grapple. The image can be hard to discern because the opponents have both red and blue sleeves. 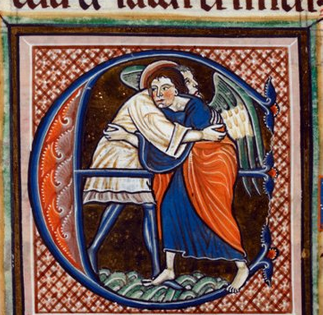 Jacob wrestling with the angel (Oxford, 1st quarter of the 13th century): London, British Library, MS Royal 1 D. X, f. 74v. 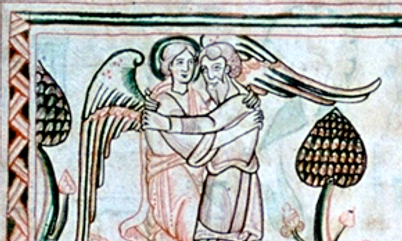 Another depiction of Jacob and the angel. In this example, they are engaged in a low grapple. 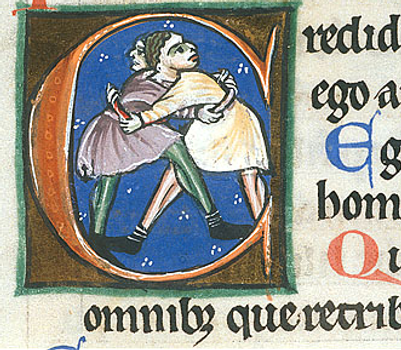 From an illuminated manuscript, the wrestler on the left has wrapped his arms around the opponent’s waist in a low grapple. 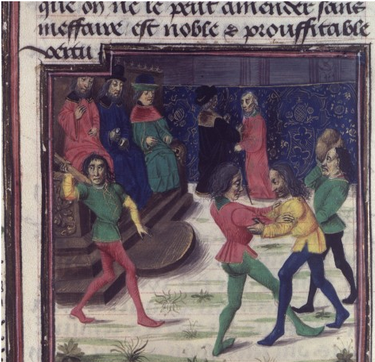 In a depiction of Renaissance leisure, as musicians play, two young men wrestle, in what appears to be a low grapple, or what might become a middle grapple. In the fluid nature of wrestling, it is not unusual to go from one grapple to another, and Fiore says as much with his plays, saying if one does not work, to try another grip and grapple. Folk wrestling known as backhold wrestling uses this lower grapple, as can be seen in the modern era with efforts to preserve the play wrestling of old. Westmorland-Cumberland backhold wrestling in which each opponent secures a lower grapple before beginning. Fiore was aware of play and mortal wrestling. His art depicts vicious techniques being used against those who are likely utilizing the only wrestling they know, that of pleasure and sport. To better understand Fiore’s martial form of wrestling, it helps to know what exactly it was being opposed to. Fiore was not alone in his understanding the difference between the sport of wrestling and the martial art of grappling. 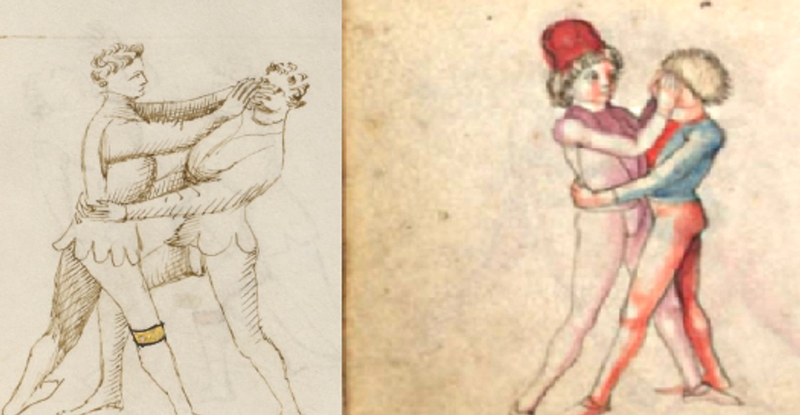 Other masters had their own depictions of martial wrestling. Fiore’s early 15th century response to a low grapple compared to Paulus Kal, from the latter 15th century. And Fiore himself understood that the typical grapples from play wrestling could be used. His depiction of a mutual middle grapple is one such example, though he warns the reader about the play. He also shows counters, meaning it was possible to use the three typical grapples, be thwarted, and then perform a counter. That said, the majority of Fiore’s wrestling is opposed to the three typical grapples, high, middle and low, that can be found in the play wrestling of Europe through its art, descriptions and still seen in today’s modern folk wrestling. I may not be a great wrestler myself, but one has to admit- I can be clever. Come check out the Phoenix Society, or book me for an appearance! 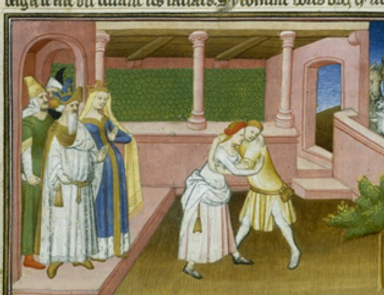 A list of Medieval and Renaissance artwork (other than fight-books) depicting wrestling. 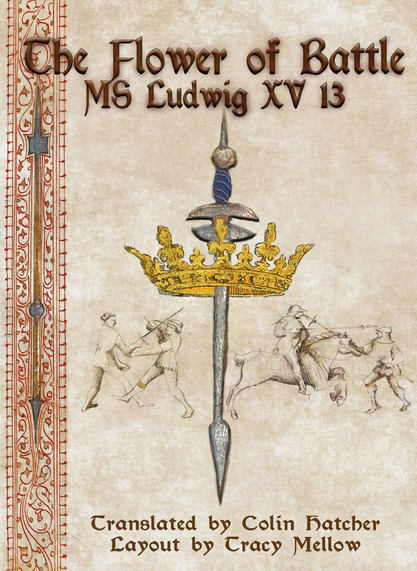 Jessica Finely has a book on German Medieval wrestling. If you like articles such as these, consider being a patron. Consider some of the books I have to offer! YOU are my advertisement. I'm on my own, and so I rely on readers and HEMA community members, and the occasional passerby to support my efforts. So, if you buy a book, thanks much! If you bought a book, please consider an Amazon review and THANK YOU for your support.